...as Reiniel mentioned, Oliver & Oliver is producing rums the Cuban way. That means (if i understood it right) blending rums not only with alcohol (90 - 96 % alc), but also aguardiente (50 - 60 % alc) and malta (70 - 80 % alc). That kinda resolved my question "what is aguardiente." The distillate: Since the company does not have a distillery so where do they get the stuff from? It's from Trinidad and Tobago and also Panama. It takes one and a half (1,5) months to ship it to their facility. The barrels: They are shipping bourbon oak barrels from the states and barrels that were used to age cherry from France. The bottling: Filling and checking is done manually. Going through the bottling facility we ended up in the laboratory which i have to say was amazing. Omar Lopez, the master blender & Ricardo Giuliano, the Vizcaya creator were in the middle of development. You could see their passion while tasting new blends. Introduced to Mr. Giuliano we started talking about Vizcaya (5 gold medals, best product and best production) and what made him create such a rum. "I wanted to create a rum how I imagine rum should taste like." I was told that they currently finished the version of Vizcaya Blanco which will hit the market in June/July. The smell was gentle and sweet and I have to say I am not a big fan of white rums but when I tasted Vizcaya Blanco ... this is the first white rum i tasted which can be enjoyed straight! It had a nice sweet taste it left a really good impression. Definitely getting a bottle when it comes out. Omar Lopez, the master blender of Oliver & Oliver is Cuban origin and was in charge of the principal distillery in Cuba years ago. His creation and personal favorite is the Cubaney Cincuentenario rum and as he says "el mejor ron del mundo" (en. the best rum in the world). Its a blend of rums aged to 25 years with 41% alc. I enjoyed this rum very much. A rum with character. As we were tasting all the rums we were introduced to a couple of experiments from the laboratory. Concretely a honey and caramel rum which I have to say was an honor to taste. The honey rum has its final formula and they are currently developing the label and bottle design. What really surprised me was that mr. Lopez actually visited Czechoslovakia 23 years ago! We tasted most of the rums and the tastes were exceptional. After the 5th rum my tasting ability weakened, but that only means I have to visit them again and continue! For me a nice surprise was the UNHIQ XO which is a blend of rums aged 20-30 years and bottled with 42% alc and the same formula from the year 1985. Even though such a high alcohol amount this rum was soft and really rich. 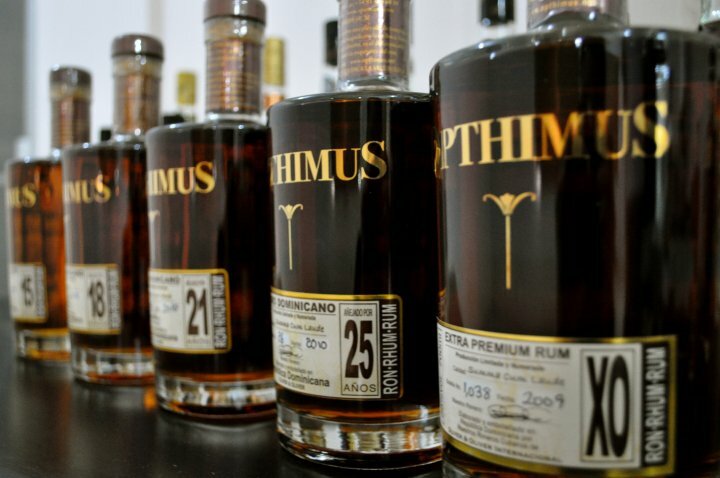 The rum Opthimus, Cubaney Grand Reserve and Atlantico (40%) with a (according to the master blender) guayaba (papaya) smell really surprised too! When I thought they showed me everything they showed me Mamajuana. A dominican mix of spices, honey, wine and rum. This one had a much stronger taste. The idea to produce mamajuana started with mr. Jack Astacio who we also met at the factory. Oliver & Oliver has some really interesting rums to offer and since it is a small company and the times are hard they cannot compete with Brugal or Barcelo with prices, but they definitely can compete with quality. This visit was extremely educational and sometimes I think i got too much new information so I just hope I didn't forget or misunderstand anything. I also strongly believe this was not my last visit to this factory so I can provide some more information about this unique rums and the tradition that lies behind them.